Just when you think you’ve made the most out of your home’s value, we’re here to let you know what else you can do! People forget how much unused space they have in their homes for both using and adding value. So today, we want to remind you of how beneficial it can be to expand your living space by finishing your basement. It’s easy to do and boosts your home’s resale value quickly. If your family is needing more space but you don’t want to move, then finishing your basement might be the best option for you. They offer a great separate space for guests, home offices, entertainment rooms, fitness and play spaces. At Unique Home Building, we love helping your house to be the home you dream of, and it’s important to consider the details in the process. Of course, you want to make sure you’re moving forward in the most cost effective and most stress free path possible, so we want to share some important tips with you. For starters, remember that basements are below the ground, making them really dark, so light and bright should be the highest priority. The right lighting can either put the perfect finishing touch on your basement or ruin it completely. Choose lights with a golden hue rather than blue, to keep the mood joyful; light and the lack of it has a powerful effect on people and you want to make sure you’re encouraging good moods. Face lights upward for a feeling of expansion in a small room and facing downward for large rooms to make them appear smaller. Next, you want to avoid feelings of claustrophobia, so people feel comfortable in the underground getaway! This means creating as high ceilings as possible especially if you’re thinking of making it a room where you or children will be active. Lift your arms overhead. Will you be standing on a treadmill? Height can be one of the biggest challenges in basement remodels. Next, you want to make sure you both avoid and prepare for water damage – whether it’s from pipes or the weather. You’ll want to have a system in place to deal with the water overflow and choose a flooring material that can handle getting wet as well as install a floor drain. Be sure to talk to a plumber about special piping and care. 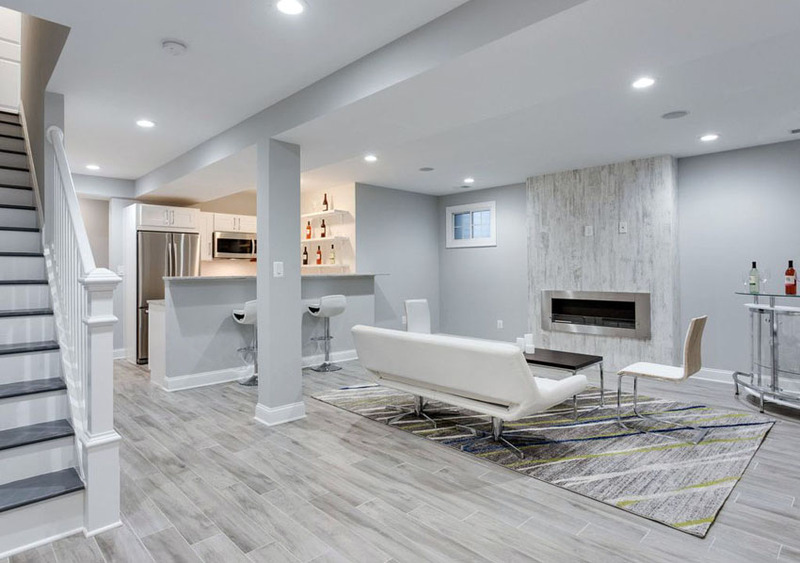 Those are the basics you need to know about basement remodels. Of course, you want to make sure to follow the rules legally, get the right permits and hire a contractor to keep on you plan and making smart choices. The contractors at Unique Home Building are here and ready to answer your questions and join you every step of the way. Call us and schedule an interview today!